Since it's almost release time for our foxes, we would like to reminisce about their arrival to the center, back in the spring, when they were all small and fluffy! We went through our archive and found gold! Last spring, we had two lonely baby animals that needed company and comfort! Lonely Girl the fox cub and the tiny badger cub, who'd lost her sibling earlier that spring. 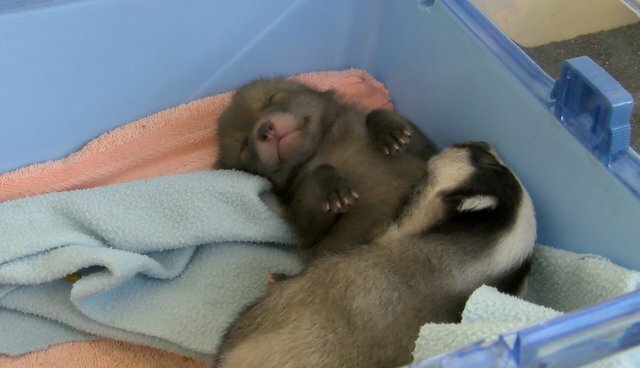 Fox and badger cubs really need company and warmth when they are young. We don't like crossing species, but it's better that an animal is with another animal than risk them being humanized or imprinted. Hence why we decided to put them together, until we had more orphans to pair them with. They got on really well and slept tucked up together all the time!